For those of you who have not read the Sheba story here is some background on Ben. He was a Pound Dog, home castrated, tooth knocked out, scared of people and sticks, He was so bad when I got him that I ended up keeping him and he became a very good faithful cheeky boy. He and Sheba became the greatest of friends and one would not go anywhere without the other. When she died I had to hand feed him for 3 months because he was fretting for her. He eventually settled into a new routine. Six months later I decided to get him a new friend. I named her Shez. He tried to play with her like he used to with Sheba where he and her would play tug and war with the ball, but Shez was too young to understand and simply wouldn't grab and pull on the ball in his mouth. Eventually he would give up with her and lie down and she would then climb all over him. Shez though always remained a scared girl and never got into the tug and war routine. Only the ball with her counts. 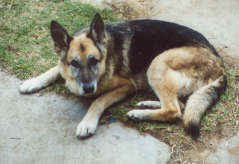 Ben during his growing up years with Sheba used to often give her a hard time but she gave back as good and the two where always best of friends, Shez ended up roughing him up just like he used to do to Sheba but he did not give her back what she gave him, instead he placidly took all her cheek.